At year’s end, I always wonder where another 365 days went. I’m a slowpoke and constantly crave more time. Now, experts predict, if I live 25 more years, I might visit Mars, where the year lasts 687 days. You can’t buy a ticket, yet, but to my surprise, the online Google search “Mars travel brochure” produced 5,710 results. Science nerds of all ages have been working this meme for a long time. And why not? Mars offers the ultimate wilderness adventure. 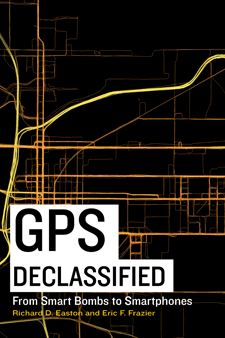 The roughly 140 million-mile trip will take an estimated nine months, each way. Launch windows open once every 26 Earth months. During the flight, you may have a hard time keeping food down but a good time learning to juggle it. You’ll learn to sleep in restraints and poop in a suction potty. At your destination, whatever your accommodations, you will be surrounded by a rugged, rusty landscape entirely devoid of flora or fauna but abundant in crags, crevasses and craters. We know this because NASA’s rovers have extensively photographed the Martian surface. Those who ask why shutterbugs travel great lengths to photograph scenes already captured and published don’t understand the obsession. 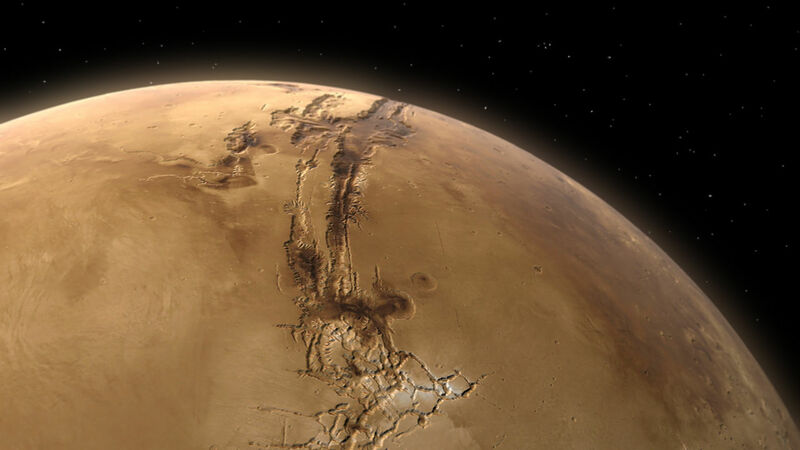 A simple model of Valles Marineris on Mars using Autodesk Maya by Kevin M. Gill, from Wikimedia Commons. Besides clearing your calendar and choosing a camera, your preparations must account for additional factors. If you think Earth’s weather is getting crazy, how does a temperature range from -284 degrees Fahrenheit to 86 degrees sound? Layering definitely seems like the way to go. And the humidity? That, too, varies wildly, from bone dry by day to 100 percent at night. I’m packing that expensive high-tech underwear with silver-infused fibers. If it doesn’t keep me comfortable, it might work in a pinch as a makeshift antenna. And then, there’s the air, or lack of it—2 percent nitrogen, no oxygen and 96 percent carbon dioxide. Isn’t that the stuff we’re killing our planet with? Did I mention the planet-wide dust storms? 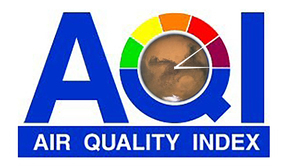 Looks like the Air Quality Index on Mars has maxed out. What is that color? Dried blood-red is the new orange? Your tour company will probably supply a pressurized spacesuit. As with shore excursions that use rented snorkel gear, doing your homework beforehand will yield dividends in comfort and safety. Use Yelp on Earth to avoid yelping on the Red Planet. Despite these challenges, three billionaires, Elon Musk, Jeff Bezos and Richard Branson, see gold in space and eventually perhaps in the red hills of Mars. Branson will probably carry the first tourists into orbit around Earth aboard Virgin Galactic. Musk will probably land the first people on Mars aboard SpaceX. Bezos is more focused on colonizing the moon with Blue Origin. But he will undoubtedly be the one to offer Amazon Prime Mars 275-Day delivery. A friend recently bemoaned the likelihood that humans will colonize Mars and trash a second planet in our solar system. I’m against trashing anyplace and acknowledge the troubled history of colonial regimes, but I favor space exploration and extraterrestrial settlements. No less an intellect than the late Stephen Hawking believed humanity must move beyond Earth to ensure our long-term survival. The legendary physicist, who pondered black holes and interstellar travel, cited our manifold risks: overpopulation, climate change, nuclear Armageddon, an asteroid strike, etc. Not putting all your eggs in one basket is pretty basic. The more we focus on all that Mars lacks for humans to live there, the greater our appreciation will be for the natural climate and environment we are threatening on Earth. Space-related research has spun off numerous new or improved commercial products, including GPS, camera phones, scratch-resistant lenses, CAT scans, LEDs, wireless headsets, memory foam, insulation, artificial limbs and computer hardware and software. We’ve come a long way since Tang and Space Food Sticks. Yes, I’m old enough to remember and to have eaten Space Food Sticks. That means colonizing Mars will probably have to proceed without me. But I’m glad there are brave and adventurous souls who are willing to try.